Is there an expert about photo multiplier tubes and the corresponding high voltage electronics? Two days ago, I have tried to build a 300 - 1000 V power supply for such a tube. Has anyone done that before? My problem is, I cannot decide, which design I should use. I tried to build an inductive step-up converter by switching a coil on and off via a BU2515DF high voltage high speed switching transistor. After some optimisation, it worked quite well, as I got 1350 V from 14 V at no output current and 900 V at 2 mA. But I'm afraid, that this circuit will always be too noisy. I need a VERY stable (+-0.1%) variable output between 300 and 1000 V with no spikes, noise etc. on it, and no drift. That makes post-regulation (either linear series or shunt) necessary, of course. This is not the problem, but I'm thinking about using line transformers instead. E.g., I could use four 230 V : 18 V - transformers the other way round (transforming voltage up), and feed it from a fifth transformer (all very small, of course, as I need only 2-3 mA altogether). 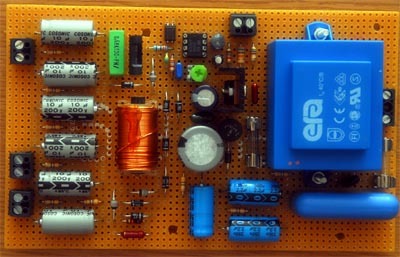 Is this a better circuit compared to the swithed-mode step-up converter. One more problem is the fact that I miss good coils, because I don't know from where to get, as they're usually custom-made. The ones I used, were actually "harvested" from old computer screens. Sorry, you're outside my actual experience here. It does seem that you'd get a lot less high frequency noise with the line transformers. You might also -- and again I have no actual experience with this -- be able to do some regulation of the output with feedback that controls the input, and again it feels (gut feel!) like this would be more reliable with line transformers than trying to control inductive spikes. Actually, I have first tried the 3-transformer-50Hz-solution. But the frequency was too low to get a smooth output with an acceptable capacitor value. So I finally built a SMPS with an inductive step-up-converter. Yes, it works! 1200V with no load and no post-regulation, and a clean 960V output after 3 filter section and shunt regulation. Working very well with the pm tube. 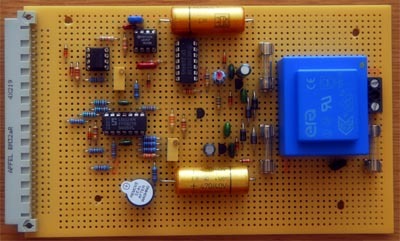 I use the hv tv deflection transistor mentioned above, and generous filtering, then post-regulation and again filtering. The switching frequency is adjustable, but in the range of 1kHz. If someone is interested in schematic etc., I could try to draw one (didn't yet, although the circuit is complertely finished and in use)! The only thing I have to change is to replace the LM324 op amp against a good one, which is already ordered. Both boards will find their place in an old computer case.